The gear config icon in the upper right opens the Options window seen in the screenshot. The red bag icon sells all items that are classified as junk. Classification is set through the options. Keep Salvagables - With this selected you will not auto-sell salvagable items. I added Consumables to the auto sell list it worked fine (since it was already there) and I tried doing the same with Schematics/Recipes by adding the item category , it doesn't work. Can you have a look and maybe officially add schematics/recipes/consumables? Thanks, the originals were offered by a french speaker also, he agrees with yours however :) I'll include them in the next revision! It purposefully sells all junk items regardless of quality, but I can certainly change that. The assumption is/was that junk items are only flagged as junk by carbine if they really are junk. As a note turning in the Celestial Lily does not give reputation or any reward at all (I did it on my Aurin Spellslinger) :( Nor does it have any quest associated or any achievement beyond the one you get from picking the lily in the first place. I can only guess that it was supposed to be a quest at some point or the achievement should happen after delivery, because as it stands now there is no reason to do anything other than pick the lily. 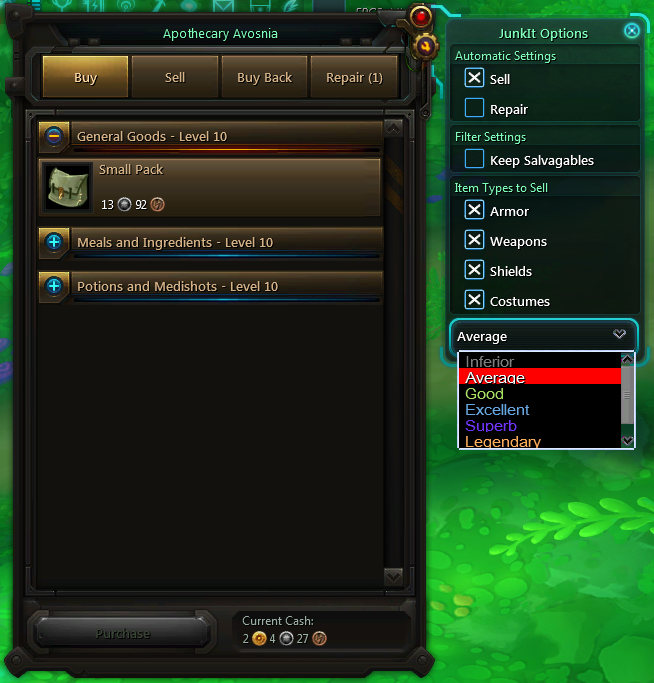 This addons autosells a purple item "Celestial Lily". Apparently it is marked as junk but can be given to a NPC (for reputation I assume). Maybe have an option to set quality for junk items as well? Fantastic addon. I love the special care to have this be carefully added into the UI. First addon I downloaded when I joined beta, so helpful. This is one of the must-have addons for the game. Auto-sell junk (and auto-repair when you hit 50) is just such a huge time saver. Fantastic.